These are sometimes called Olive Morning Duns. Though not as well known as the Hendrickson and Sulphur hatches of the Ephemerella genus, Drunella cornuta (Olive Morning Dun or Large Blue-Winged Olive) is nonetheless an important Eastern hatch. Lloyd Gonzales, in his book Fly-Fishing Pressured Water, notes that this attractive olive-green mayfly can provide good-to-excellent morning fishing in the faster sections of many streams. He also mentions that it can hatch in surprising numbers and usually faces less competition for the trout's attention than many of the spring or evening-emerging ephemerellids. Yet, cornuta and its sister species have largely escaped the limelight. 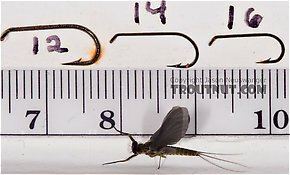 The renowned twilight hatches of big Ephemera drakes and many other popular mayfly species command fly fisher's attention at this time of year. As the days lengthen, fishing all of the available mayfly hatches would require a pretty long day astream, so most anglers choose to focus on the late afternoon and evening activity. Nature seems to have several recurrent color themes, and one of these is gray-winged/olive-bodied aquatic insects. Perhaps this explains why the name "Blue-Winged Olive" is often held up as the poster child for common name confusion. It has been freely applied to a multitude of mayflies in various families, genera, and species. 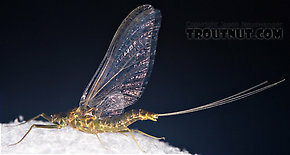 Prior to having a well-established common name, this mayfly was referred to by Gonzales as the Olive Morning Dun. 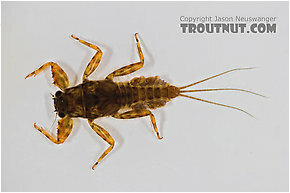 However, it has already been added to the long list of "BWOs" on many Eastern/Midwestern hatch charts.